The purpose of our brand, is to develop products based on chia seeds. But the basis behind our development process is not just to add chia seeds to a product just to say it has chia seeds in it. We put chia to work….not only add it as an ingredient for its nutritional properties. Therefore, we have two main purposes: First, is to put chia to work. We take advantage of the mucilage that covers the seed, which reacts on contact with water, expanding 10 – 15 times its volume, which is a natural mechanical reaction that we use to thicken the fruit, therefore, removing the industrial pectins, common in jams, marmalades and fruit spread. 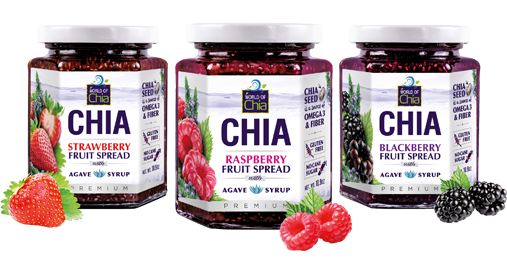 Second, by adding chia seeds instead of pectin, we bring to the product all natural and healthy properties of chia seeds, which is not an industrialized ingredient, and it also has a high content of omega 3 fatty acids, fiber, protein, minerals and antioxidants. So, our product development just makes sense!!!!! 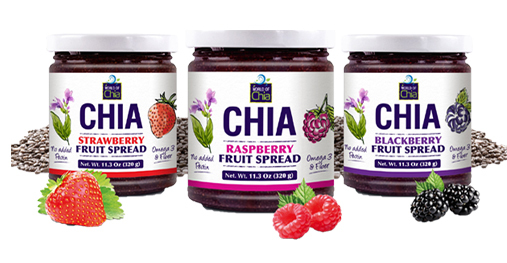 Our Chia & Fruit Spreads are developed with natural and healthy as the most important characteristic of the product. They do not contain pectins, acids or added sugar cane. Our chia fruit spread glycemic index is low as our products are not made with sugar cane, and instead sweetened with agave syrup. Instead of using acids, we use squeezed lemon juice as one of the only 4 ingredients in the product (Fruit, Agave Syrup, Chia Seeds, Lemon Juice). Our products are all natural, vegan, gluten free, free of preservatives, colorants, additives or flavorings. With a natural and healthy flavor profile, they represent the new age of natural and tasty fruit spreads. Our Standard Chia & Fruit Spread, is a traditional fruit spread, made the old way, sweetened with sugar, but thickened with the mucilage of the chia seeds, instead of pectin. We believe pectin is not a natural ingredient, and manufactured using industrial and chemical processes that are just not right for the body. Therefore, we are making a fruit spread that does not have any of that, and that is naturally thickened with the gel substance produced by the mucilage that covers the chia seed. This is a natural process, that uses only the juices of the fruit to make the natural, thickening reaction.